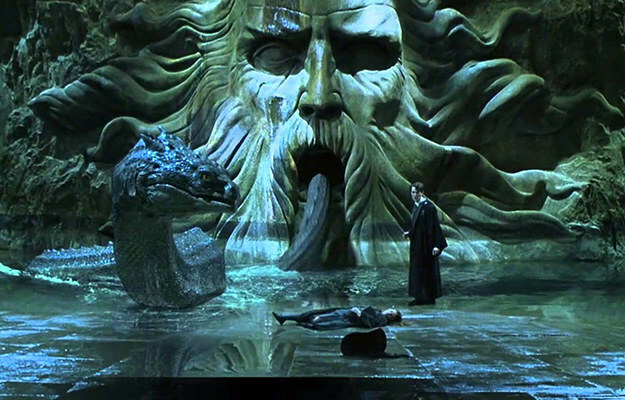 We see in the Chamber of Secrets when Tom Riddle summons the Basilisk, he looked at the Basilisk's eyes directly. So are they immune to the effects, or is it just the controller? There's no canon proof either way. Even if they aren't, there’d be ways around it. They’d know that the looking into the eyes of the basilisk can kill, so they'd be careful not to. Most of the basilisk victims were probably caught off guard by the presence of a basilisk. The Parselmouth controlling it would both know of its existence, and that its stare is deadly. So, if they can be killed by it, they'd probably be careful not to look into its eyes. That should be easy enough. A basilisk is very large, so even if they need to look at it, they can just look somewhere else. In addition, presuming basilisks have functional eyelids, if there's a chance that they might look at its eyes accidentally, they can just tell it to close its eyes. It's possible the basilisk can control if its stare kills, and not use it on the Parselmouth. There's no canon information available on whether the basilisk is actually trying to kill each of its victims. We do know, however, that each of its victims are people who Tom Riddle would have wanted dead. No one died who Tom would have wanted to remain living. It's at least possible that the basilisk has to actually be trying to kill someone with its stare for it to work. In that case, the Parselmouth would be completely safe, once it's not intending to kill. Tom, at least, was only a memory, so the stare of a basilisk might not have any effect on him. As for how it could work on a ghost and not on him, he says himself that he was less than a ghost when his Horcruxes were the only thing keeping him alive. "I was less than spirit, less than the meanest ghost... but still I was alive." When Harry looks at the basilisk, Fawkes had already torn out its eyes. Harry's ability to look at the basilisk is irrelevant to his ability to speak Parseltongue. A basilisk can kill with its stare, but that's presuming it has eyes. No eyes, no stare. That's almost certainly why Fawkes tore out its eyes to begin with. The phoenix isn't a characteristically violent creature, and neither is Fawkes specifically. The logical explanation for him resorting to violence like eye gouging would be to neutralize the basilisk's most powerful weapon. The creation of Basilisks has been illegal since medieval times, although the practice is easily concealed by simply removing the chicken egg from beneath the toad when the Department for the Regulation and Control of Magical Creatures comes to call. However, since Basilisks are uncontrollable except by Parselmouths, they are as dangerous to most Dark wizards as to anybody else, and there have been no recorded sightings of Basilisks in Britain for at least four hundred years. The only advantage of a Parselmouth is their ability to control a basilisk, not being immune to its effects. Basilisks aren't dangerous to Parselmouths. No. Parseltongue is a language, though an inherent one, and as such cannot afford the speaker immunity against the Basilisk. Tom Riddle is a 'ghost' conjured up by the diary - notice that the diary is down in the chamber? This 'ghost' of Riddle cannot be anywhere that the diary isn't, which is why he couldn't get to Harry before he convinced Ginny to throw the diary into the girl's bathroom so he could manipulate Harry into finding it. Meaning that because he is even less real than Nearly Headless Nick, who is momentarily paralysed by the Basilisk's stare, he can look it in the eye and not be affected. Think of it like this, the Tom Riddle we see is a ripple in time, a tiny fold that can interact and even manipulate things around him to a small extent, though he requires a source of power to feed off of, and that is Ginny. The only reason Harry can look the Basilisk in the eye after he'd been chased through those tunnels is because Fawkes tore its eyes out. Without its eyes, the Basilisk cannot use its magic, thus being unable to paralyse or kill anyone with its stare alone, which is why it goes from being passive-aggressive to physical aggression. Think about all the students it paralysed. Why didn't it try to bite them like it did Harry? Because its eyes had done the work. The students wouldn't die right away since they'd all seen the eyes indirectly - mirrors, pools of water, a camera - but like any coma patients, their bodies would eventually starve of nutrients and they'd die, meaning the Basilisk didn't need to actively attack anyone, and why it didn't finish them off by tearing out their throats (that, and it's a kid's book). Conclusion; neither Tom Riddle, Harry Potter, or any other person who can talk Parseltongue is immune to the stare of a Basilisk. In fact, I'd go as far as to say that it had always been Riddle's plan to use a Horcrux to unleash the Basilisk when he was no longer at Hogwarts, thus removing the risk of it turning on him - he was a Mudblood, after all, and the Basilisk was raised by Slytherin himself to attack any non-purebloods - and that the one previous time it was unleashed was him basically taking it for a test drive. Not the answer you're looking for? Browse other questions tagged harry-potter basilisk parseltongue or ask your own question. How Did Tom Riddle Find Out About the Existence/Location of the Chamber of Secrets? How Did Ginny Weasley Set the Basilisk on Muggleborns Without Getting Killed or Petrified? How could a memory (Tom Riddle) have performed Avada Kedavra? Why wasn't Fawkes killed when it attacked the Basilisk? How could the Basilisk tell if a student was Muggleborn? Would seeing a Basilisk in a memory cause death? Did the Basilisk attack anyone else in the 1940s? Why did the Basilisk in Harry Potter only listen to the Heir of Slytherin?